CBC Ideas – You might call James Carnegie – the 9th Earl of Southesk, Alberta and Saskatchewan’s first tourist. Equipped for his trip with a large India-rubber bathtub, and the plays of William Shakespeare, the young Scottish Earl set out to hunt, sightsee and seek artistic inspiration. He’d suffered a breakdown and depression, following the death of his young wife. His prescription to himself, to regain both his physical and emotional health, was to travel to the northwest. Southesk kept a detailed journal of his adventures. And he picked up a rather remarkable collection of souvenirs. For more than 100 years, that collection was hidden away in the Southesk family castle in the Scottish highlands. But thanks to the Royal Alberta Museum’s recent $1.1 million purchase, these First Nations and Metis artifacts are home again. Edmonton Journal: “Sights and sounds of the 9th Earl of Southesk” (October 11, 2008). Royal Alberta Museum: The Southesk Collection (website) and Media Backgrounder (PDF). 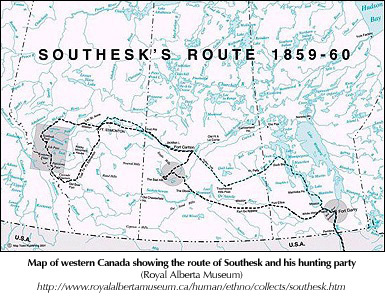 Edmonton Journal: “Earl of Southesk saddles up to trace ancestor’s journey” (July 31, 2009). BBC: “Scottish earl retraces Canada trip” (Aug. 21, 2009).